The first Ferrari Sergio has arrived in the United Arab Emirates. It has been delivered today to its new owner, the SBH Royal Auto Gallery in the UAE, at Abu Dhabi's Yas Marina Circuit, where the Finali Mondiali Ferrari are being staged and which is home to the Ferrari World theme park. The Ferrari Sergio's performance and dynamics are excellent in the extreme too. It is based on the 458 Spider and retains the latter's technological content as well as all of the functional aspects of its cockpit. It is powered by the latest 605 hp version of Ferrari's naturally aspirated 4497 cc V8 which has won the International Engine of the Year award on three consecutive occasions. This power unit also guarantees the car sprints from 0 to 100 km/h in just 3 seconds. 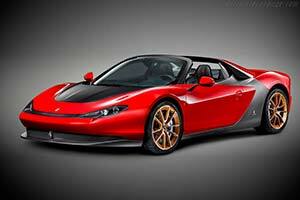 The Ferrari Sergio has an extremely simple, clear style. Both its volumes and treatments of its surfaces reflect the spirt of Pininfarina's 1960s and 70s creations for Ferrari. Its proportions have been pushed to the extreme with the front of the car seeming to penetrate the rear which itself projects forward. The result is an exceptionally sculptural, three-dimensional take on the classic roadster. The two bodyshell masses are melded together via a longitudinal black insert, the main styling cue of the design. The flank is also characterised by the same black longitudinal element which acts as both a dividing and unifying element between front and rear. The two sections of the car flow effortlessly into one another resulting in sublimely harmonious yet extremely muscular forms.